What is the best vehicle for player exposure? Things have certainly changed since my days of HS ball, and trying to get noticed by scouts. What is the best way for our kids to get looks today? Wow… that’s a hard nut to crack today. I grew up in a working class neighborhood - mostly Irish, and the trades were the norm for every dad. Hence, the money spent on baseball, across the board, evenly spread out. There were no “have” teams vs the “have not” clubs, and since baseball was king, we all shared in the learning curve. Now here’s the thing about playing ball then, as appose of today - we competed against neighborhoods. I lived in a predominately Irish neighborhood, and we played against the clubs in different sections - the predominately Italian, predominately black, predominately Latino, predominately Portuguese, and so on. The rivalry between the schools in those neighborhoods, kind a set the stage for all the sports back then. Hence, there were little in the way of travel ball, elite pay-n-play, etc. So the sports page of every main and small paper, carried the interest of those sport’s minded enough, throughout the seasons. In any event - today it’s a different picture. It seems to be a “who you know,” how big of check can your dad write so you can be the golden haired boy, and a ton of politics and even a dash of racial persuasions that gets into the mix. Good question by the way. I wish I had a better response for you to go by - but I don’t. Just to add one thing - as time went on and clubs were forming beyond the confines of the “norm”, I remember a club I was on during my junior year of high school. I met a buddy of mine, and we both went down to a field on the outskirts of our neighborhood. There was a collection of thirty guys trying out for this newly formed club, in a new league. These guys were from all over my hometown. For the first time for a lot of us, we were competing for a place that was otherwise expected because of where we lived. I got cut in the first hour, and so did a lot of guys. A real wakeup call, let me tell you. I found the schedule of this club and myself and a few others who were cut, went to their first game. Gee-Louise, these guys were good. They all got along and played as one. Different guys from different backgrounds, racial, and even religious. What we were looking at was the field of opportunity across the board. The opportunity of “play” - without attitudes. The best stay… they rest go home. Freindswood45’s, I would try Area Code Baseball Instructs. You can go to their website https://www.areacodebaseball.com and they will have a schedule of their instructs in your area. 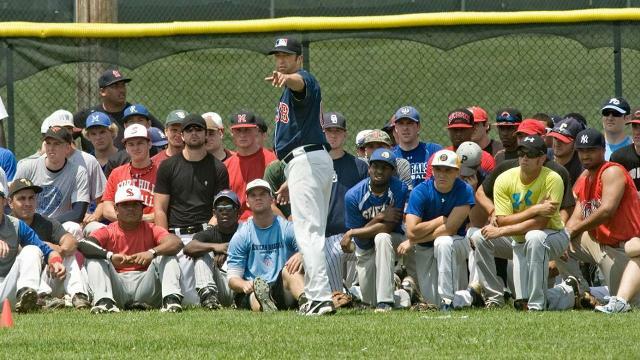 For $150 your player will get to perform and get instructions from Major League scouts. We are currently doing the select ball / travel ball deal. These tourneys seem to be filled with teams that are pay to play regardless of talent. Scouts / coaches are not dumb. I still see more at the local HS games than the weekend tournaments. I’m not a social media guy, I imagine people are using some form of it to get the old school style recruiting videos out there. Which are the best, in your opinion? And, I think I will start reading all of Coach Baker’s replies. He tells awesome stories. How old is your son? Does he play for an organization or an independent team? My boy is about to be 12. We are one of the LL Allstars team that left to play select ball. He is a few years out from serious concerns, but just trying to get my head wrapped around how things work now. There won’t be any scouts at the tourneys you are playing in as youth baseball tourneys typically cap at the 14U level, these are 8th graders. The tournaments you are playing in now are for learning the game, learning to compete, etc… Things get started for “exposure” at the 15U level and really don’t get serious until 16U and 17U. There are basically 3 seasons for kids this age. High school baseball in the spring (playing for your school), summer tournament season, and fall showcase season. HS Ball- If your kid is a stud scouts will find him, your coach will likely have some limited connections unless the school is a baseball powerhouse then he will have more. Summer Tourney Season- It’s like select ball but the tourneys are typically on college campuses. There may be some scouts but not many. This is where your kid learns to grind. Expect heavy regional travel and possibly national travel if the team is elite. If they are, you will play 1 or 2 national level tourneys where there will definitely be scouts. Fall Showcase Season- This is where your coach/organization earns their money. The showcase season is where high school teams from select orgs travel to colleges and work out combine style for the staff at that particular school. Typically the fall will consist of 4 to 5 of these showcases at different schools around your region. There will also be a few fall tourneys likely mixed in. My view is this, playing on an independent team at 12U and under is fine as long as your kid is learning, growing in the game and having fun. By 13U or 14U I would suggest trying out for some teams that feed into strong High school age programs and start playing for one of these orgs. Outside of this, there are showcase organization that put on events. Be careful here, knowing which are legit and which are money grabs is tough. Stick with reputable organizations like Perfect Game. I suspect from your handle that you may be in the Houston area. If so, feel free to direct message me as I have a pretty good handle on the orgs in the area. For your future reference, here’s a article that well worth reading. With Spring Training in full swing, players across the world may be wondering how they can get in affiliated baseball and play for a Minor League team. We asked MLB Scouting Bureau director Bill Bavasi how players can latch on. Another option is the Independent Leagues of Professional Baseball. The Independent Leagues are in no way “affiliated” with MLB. The term “affiliated” usually means the Minor League clubs that are part of a MLB franchise system. However, from my experience there is a much better chance of getting on a professional club with the Independents than there are with the Majors. On the other hand, life in the Independents (Indy’s) are as rough as it gets to make a living playing pro ball. I would strongly suggest to seek employment elsewhere and in a better line of work. Pro ball is not what it appears for those on the outside looking in. It’s a dog-to-dog existence where everyone… I mean everyone, hopes the guy next to him, breaks every bone in his body - thus leaving the door open for the next guy. If this sounds like a future that you want, or that for your son, then by all means - go for it. TXJim hit the nail on the head. This is the exact path we took with my son. Just to add to TXJim’s reply, if you are being seen by coaches at a showcase tournament or at some college showcases, have your thank you email ready to send to each and every coach that was there. If anyone is interested, I can share what we sent to coaches. Also, don’t be fooled by all of the college camp emails you will receive. Most of these camps use the money to fund their Spring opening season trips. A highly regarded coach from a D1 school once told me to ask the coaches from these emails 2 simple questions. 1. Where did you see me? 2. What did you like about me? If they can answer those 2 questions in a return email, they saw you and have an interest in you. If not, then you are part of a huge email list. Great advice, from everyone. Thank you all. Yes coach Baker, the struggle after college is a nasty business. I played ball in Eagle Pass / Piedras Negras, for a summer. It opened my eyes to a lot of things. Like the rest of us, I’d be happy with a little help paying for college. He can figure it out after that. Very nicely stated. Your advice and experience will service your son well. If you live near a minor league ball park keep an eye out for open tryouts. I knew a kids just out of high school who attended one for the Nashville Sounds. he got looked at by quite a few people. He was a smaller sized kid but could hit the ball and ended up getting signed to a team, in the independent league. But he has his foot in the door now.